AB Solutions is a unified platform of information systems for hospitals, clinics and individual specialists that provides effective execution of all business processes required by any health care professional involved. AB solutions are developed to optimize entire treatment process, from reception to different procedures, like drugs prescriptions and checkout. AB Solutions: Hospital – information system suited for large healthcare facilities. System is designed for planning and organizing the workflow of the hospital at ambulatory as well as stationary level. AB Solutions manages fast and precise exchange between specialists and the diagnostic departments. 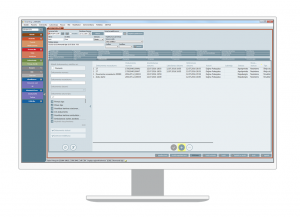 AB Solutions: Clinic – information system for smaller clinics and healthcare centers. It provides the clinic with an effective financial management. By using the AB Solutions statistics tool you will be able to analyze and predict the effectiveness of the clinics resource utilization. AB Solutions: Practice – it provides everything needed for basic everyday business processes encountered, such as work time planning, patient reception, treatment, data processing and exchange, finance management and report generation, whether by a nurse, or a general practitioner. It’s a set of the AB core functions, so you don’t have to pay for functions you do not use. AB Solutions: Dent – a specially adapted information system for dental clinics and practices. The program automates work flow of the institution. Functionality includes solutions such as work organization for reception, treatment plan, dental electronic card, as well as the opportunity to create reports at the administrative level. High data safety level. All data is safely stored on MediCloud for later usage. Complete management of institutions operations starting from making an appointment in the registry till preparation of reports and statistics at administrative level. Convenient for making statistics and inner management itself. Easy- to- use calendar tool for arranging appointments and working schedule, with the option to access patient’s information. It can be easily integrated with other information systems that are used in operation of a company. Simple document processing and faster work process.